I hesitate to tell this story. One, because it’s deeply personal and two, because it might appear that I lost a marble or two in Peru. But I will tell it anyway because it made an impact on me, and because perhaps you have had an experience like it yourself. On the morning we awakened on the altiplano (high plain), our overnight home at 12,000 feet in the Andes, about half the group hiked up to the Inti Punku, the Door of the Sun, at the summit. I elected to stay back with the other students and use the time to meditate. After a little more than an hour of meditation I decided to explore the canteras, the quarries. 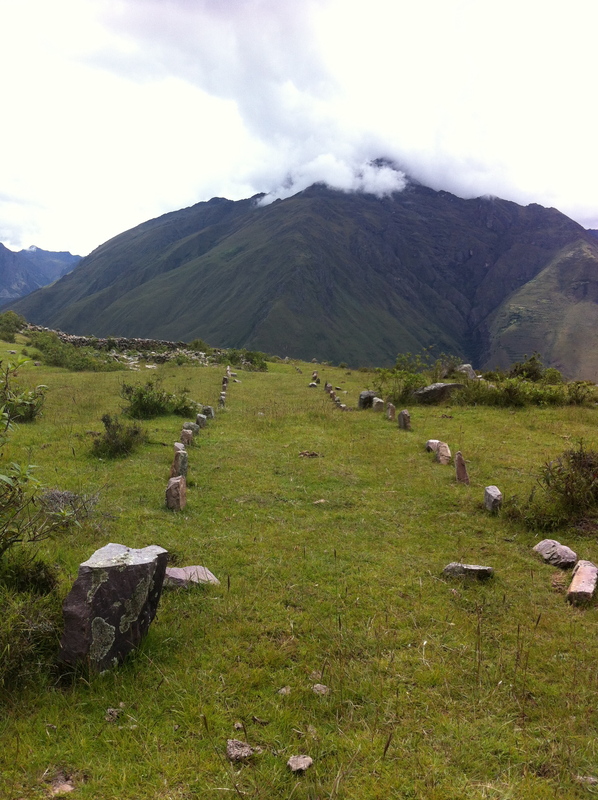 From the moment we arrived the day before I was incredibly drawn to the stone pathways laid by the Inca. I wanted to walk along them, see where they went. I wanted to touch and explore the stones left where they fell centuries ago. I descended the campsite to the quarry area. Smooth, accurately-cut huge stones litter the site. You can tell that the stones were cut by humans, although it’s difficult to fathom how they achieved the feat without modern machinery. 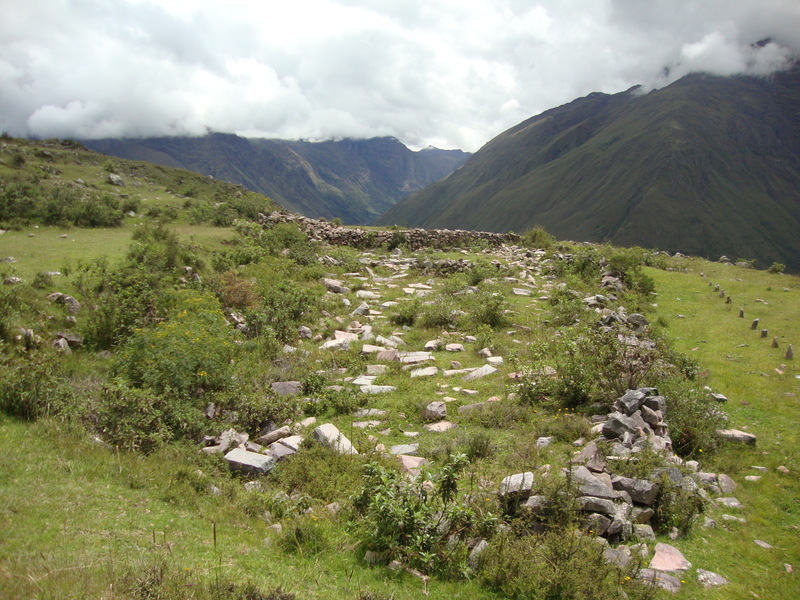 It is said that some stones from this mountain quarry were hauled off and used to build Machu Picchu. How I’ll never know, since Machu Picchu is about two hours away by train. But miracles inhabit Peru. Still standing are portions of walls. Some look like they may have been walls of homes and others look to be part of an ancient marketplace. I ran my hands across the smooth stones. I climbed on the cut rock, jumping from one to another. Then I began to walk along the path. It was grassy in the middle with stone markers embedded in the Earth on either side, placed evenly several feet apart. I walked slowly, the cool mountain breeze blowing my hair. My feet sunk ever-so-slightly into the soft mounds of grasses. The ground on the altiplano is gently undulating, as if a boulder were thrown a million years ago into the center and the Earth is still rippling in its wake. I came to a circle of rocks that looked to be a fire circle; at least that’s what I imagined, since the inner rocks seemed blackened. 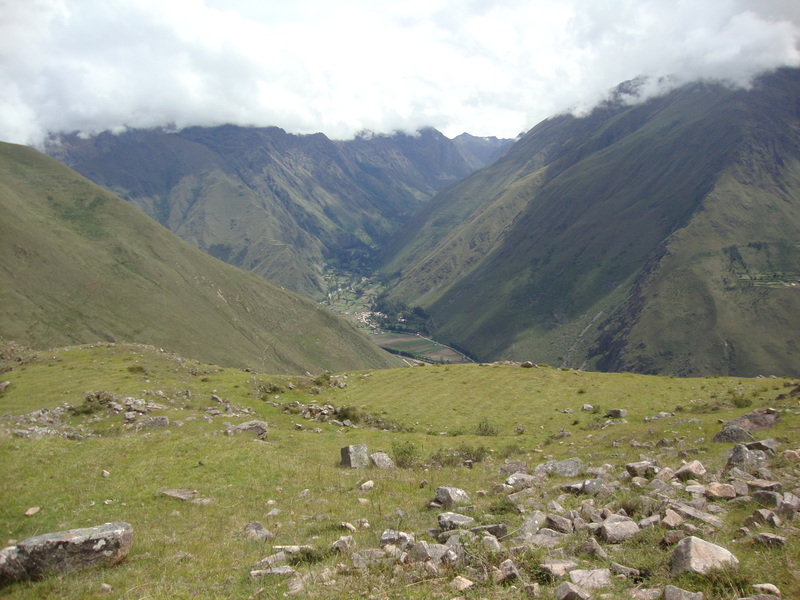 I sat upon the edge of the circle and looked out over the valley below and to the surrounding peaks. Such purity of beauty can be nearly heartbreaking. The wind has a way of sounding like it speaks to you. As gusts of air rushed past my ears, sounds fell in. At first the sounds were indeterminate. It was soothing, yet big and powerful. Then the sounds began to take more form, almost like words, but nothing I understood. I took a deep breath and closed my eyes. My chest filled up with a feeling, though I cannot describe what that feeling was. My heart began to pound and my ears pricked. The hair on the back of my neck stood at attention. The sounds of voices emerged clearly above the sound of the wind. I opened my eyes and turned to see if I were hearing students up on the plain above me. They were in silent meditation, far apart from one another. It wasn’t their voices. My belly did a little somersault. I was feeling something but I still couldn’t define it. It felt important and good, not at all scary. I closed my eyes again. Clank. Clank. Mumble, mumble, mumble. The clanking sounded like tools on rock or perhaps rock against rock. The mumbled voices resembled a crowd of people all talking at once. I focused. Could I hear distinct words now? I thought I could, but the words were not Spanish. Perhaps Quechua? And then a vision came to me of a marketplace or village full of people talking, moving about. Animated. I saw women with babies in slings on their backs. I saw men pounding on large stones. Clank. Clank. The quarry had come to life. I opened my eyes to find, of course, just ruins and rock and grass. But the sounds of voices remained. I listened intently for what seemed like half an hour. It was probably only a few minutes. Laughter. Argument. Everyday exchange. Mumble, mumble, mumble. The wind howled now, carrying the voices out into the distance and back again. I felt I was not alone. I felt to be amid a throng of people, yet unnoticed by them. I knew that I was hearing the voices of the past. The past people of these mountains were making themselves known to me. I don’t know why. Perhaps they make themselves known to all who listen. Randall, one of our guides, had said to us that if we were quiet, we would be able to hear the mountains. If we concentrated and were open, nature would speak to us. This must be what he meant? Were the mountains whispering their history? Were the souls of an ancient people still present? Ask an Andean and they will answer matter-of-factly: yes. They believe that nature is animated and alive. The Earth isn’t just a rock hurtling around the sun, it’s Pachamama, Mother Earth, a being. The apus, the mountains, are alive with spirits. 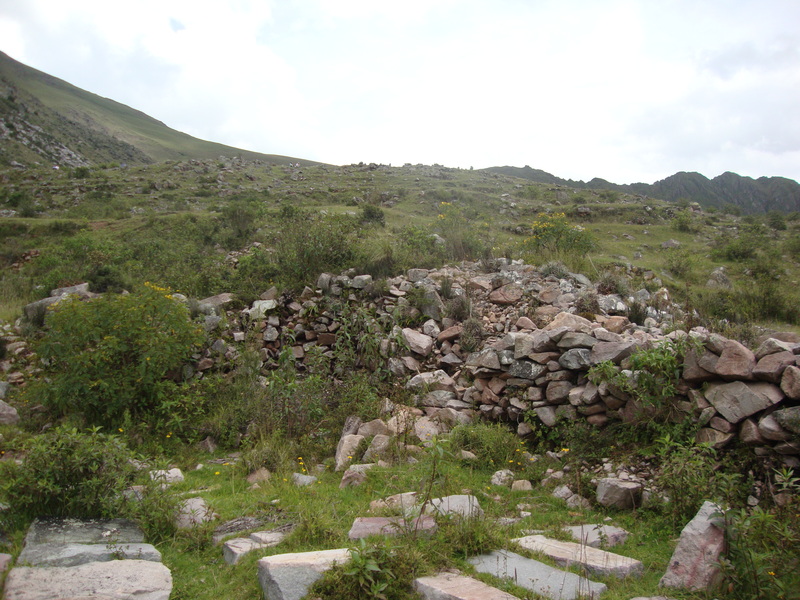 Andeans pray and give offerings to Pachamama and the apus, as did the Inca before them. 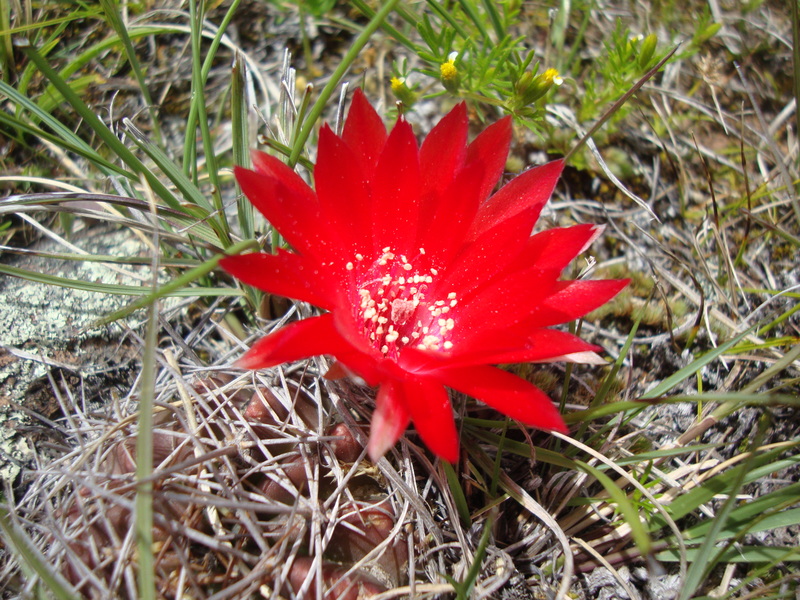 I ambled back up to the campsite, stopping every so often to run my hands once again over the smooth stones and nod in return to the flowers. I said a quiet goodbye in my heart to the echoes of the past. I felt happy, satisfied, and deeply at peace. Since I’ve been home I’ve reflected on that morning quite a lot. Had the lack of oxygen given my brain a little ride? Had I indeed lost a marble up there? The logical me, the everything-can-be-explained side of me says it was fancy, only my imagination. The wind and altitude had conspired against me. The spiritual me, the anything-is-possible side of me says that what happened up there is exactly what’s supposed to happen when you’re letting go. Open hearts and minds invite the world – even the otherworld – in. The wind and the altitude had opened a door. You can think what you will about my experience, and it’s quite all right if you think I’m just a bit crazy, that it’s impossible. But the people of the Andes will disagree with you. And so will I. This entry was posted in Uncategorized and tagged altiplano, andes, canteras, Inca, peru, quarries, travel. Bookmark the permalink.